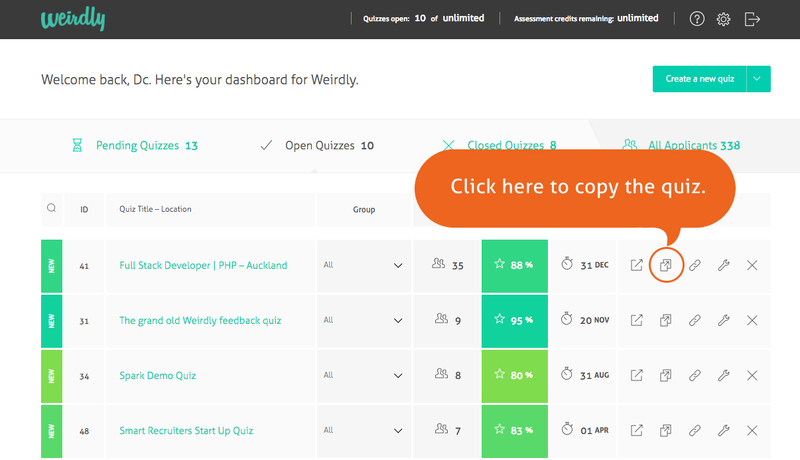 Home › KnowledgeBase › Building and editing your quiz	› How do I copy or duplicate a quiz? To duplicate an already existing quiz within your account, navigate to the dashboard. You can get here by clicking the Weirdly logo or this will be the page you see when you first sign in. When you see a list of quizzes you know you’re in the right place. Find the quiz you’d like to copy, and select the copy icon on the right side of the row. This will create an exact duplicate and open up the quiz editor. Remember to rename your new quiz from “Copy of …” to suit your new role. You will find your new version underneath the Pending Quizzes tab until you set it live.